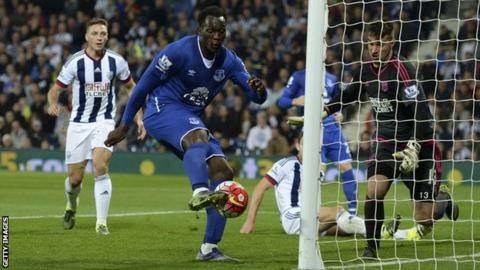 Romelu Lukaku scored twice as he led a superb comeback by Everton, who battled from 2-0 down to win at West Brom. The Baggies took the lead before the break when Saido Berahino finished well, before Craig Dawson doubled the lead in the 54th minute with a header. A minute later Lukaku rose to nod in Gerard Deulofeu's cross, and then set up Arouna Kone who fired in to level. Belgium striker Lukaku grabbed the winner with a close-range strike from another excellent Deulofeu delivery. The result moves Everton up to fifth on 12 points, while West Brom, who have yet to win at home, drop to 15th with eight points. It was a certainly a game of two halves, following a dire opening 40 minutes, but Lukaku himself had a contrasting 90 minutes. The 6ft 3in 22-year-old has had to carry the burden of a £28m price tag ever since he signed on a permanent deal for the Toffees in July 2014, following a successful season on loan in 2013-14. And despite scoring 20 goals last season, his performances were mixed, which prompted manager Roberto Martinez to defend him. Everton fans must have been wondering which Lukaku they would see at The Hawthorns. They saw both. The left side of the graphic below shows that Lukaku found himself in deep positions in the first half as he tried to get into the game. However, with Everton chasing the match after the break, he moved further forward and became more of a threat in and around the area. The service also improved from Spaniard Deulofeu, who delivered two fantastic crosses for the Belgian's goals. What happened to the miserly Baggies? For a team that came into the game having conceded only six goals in six matches, shipping three goals in one half would be a surprise to the casual observer. However, two injuries caused the Baggies' tight defence to become flaky. The first occurred when Gareth McAuley was hurt in training prior to the match, and the second when Jonas Olsson came off in the 28th minute with what appeared to be a groin problem. Everton's defence also looked brittle in the first half, which again could be attributed to injuries, with John Stones, Seamus Coleman and Leighton Baines missing. Fortunately for the inexperienced backline, the team's emphasis focused on attack as they chased the game after the break. West Brom boss Tony Pulis: "The first goal kills us. We should deal with it. The other two goals are poor goals - the second one looks offside, the linesman is looking the wrong side. It's a poor decision. "It's really, really disappointing because before we scored the second goal we had some good chances. We switched off and Everton will punish you." "Every three points is huge but it feels extra good. Deulofeu took extra responsibility, he wanted the ball all night and it was a real mature performance." BBC Radio 5 live's Steve Claridge at the Hawthorns: "Everton looked far more comfortable when they threw the shackles off and went for it. Going 2-0 down was the best thing that could happen to them." Twelve of Saido Berahino's 16 Premier League goals since the start of last season have been scored at The Hawthorns. Tony Pulis saw Stoke score 188 goals in 190 Premier League games, saw Crystal Palace score 26 in 26 and has now seen West Brom score 25 in 25. West Brom have scored 13 set-piece (excluding penalties) goals since Tony Pulis took over. Only Crystal Palace (14) have more in that period. What's next for both teams? A brilliant win sets Roberto Martinez's Everton up nicely for Sunday's Merseyside derby at Goodison Park, with Liverpool only a point behind them in the table. As for West Brom, they are away at seventh-place Crystal Palace on Saturday. Match ends, West Bromwich Albion 2, Everton 3. Second Half ends, West Bromwich Albion 2, Everton 3. Corner, West Bromwich Albion. Conceded by Ramiro Funes Mori. Attempt blocked. Ross Barkley (Everton) right footed shot from outside the box is blocked. Assisted by Gareth Barry. Attempt saved. Darron Gibson (Everton) right footed shot from outside the box is saved in the centre of the goal. Substitution, Everton. Aaron Lennon replaces Romelu Lukaku. Attempt missed. Rickie Lambert (West Bromwich Albion) right footed shot from the centre of the box is close, but misses to the right. Assisted by James Chester with a cross. Offside, Everton. Darron Gibson tries a through ball, but Ross Barkley is caught offside. James McClean (West Bromwich Albion) wins a free kick in the defensive half. Arouna Koné (Everton) is shown the yellow card for excessive celebration. Substitution, Everton. Darron Gibson replaces Tyias Browning. Brendan Galloway (Everton) wins a free kick in the defensive half. James McCarthy (Everton) is shown the yellow card. James McCarthy (Everton) has gone down, but that's a dive. Offside, Everton. Ross Barkley tries a through ball, but Steven Naismith is caught offside. Steven Naismith (Everton) is shown the yellow card. Steven Naismith (Everton) wins a free kick in the attacking half. Attempt saved. Saido Berahino (West Bromwich Albion) right footed shot from outside the box is saved in the bottom right corner. Assisted by James Morrison.